A 12-month immersive experience of live events, online events, and collaboration to connect you to what you need to grow from 1-2 locations, to 5 locations, to 10 locations — and beyond. In a peer-learning environment, find out about the critical decisions every dental group must address. You’ll get valuable insight on the key questions every growing group must address, and find the clarity and direction to determine which path is best for you. Why and how do you form a DSO? What software programs are the best dental groups using? How and when do you hire executives to enhance your managerial strategy? After registration, you'll become a part of The DEO's 12-month "Growth Immersion" Program. Using a “community-based” approach, you’ll focus each month on a key element of your dental group and gain actionable insights on how to grow. You’ll be introduced to a like-minded community. As a DEO Member, you’ll be connected with some of the best and brightest minds in group dentistry. First, you’ll be introduced to a small, personal group of like-minded peers in the industry. Over the next 12 months, you’ll interact with experts; hear from thought leaders; and review key reading material, concepts, and ideas that are necessary for any dental group to grow and succeed. The next 12 months will bring valuable connections with peers, mentors, and resources. Pre-Immersion Event: Upon registration, you’ll be introduced to content and ideas to jumpstart your journey. You’ll meet peers, review reading materials, and complete online exercises to prepare you for your Immersion Event. 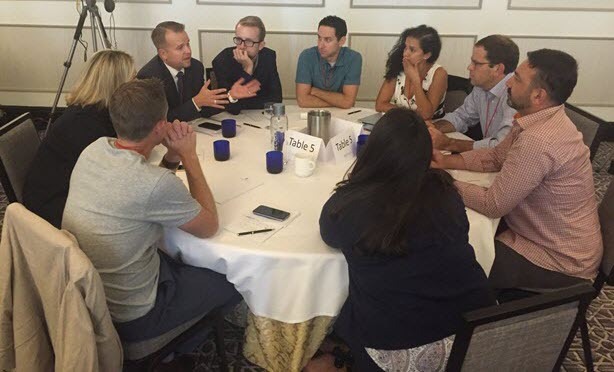 Month 1: At the Immersion Event, you’ll meet dozens of like-minded dentists and dental executives who are interested in building group practices. You’ll complete homework and exercises to begin “growing yourself” into the effective executive leader you need to be to successfully build your group. Months 2-5: You will meet regularly with your dentist-entrepreneur and executive peers. Months 7-12: You’ll attend virtual (online) events that will help you solidify and process the information you receive at live events. Month 12+ After completing the DEO Immersive Experience, you’ll have the opportunity to progress to DEO “Elite” Membership. You’ll get access to an online library. The Member Portal is The DEO’s online resource hub that Members can access 24/7. It’s got the latest DEO updates, Expert Webinar recordings with top industry experts, recordings from past DEO Summits featuring thought leaders and industry insiders, and much more. Think of the Member Portal as your personal Google for all things dental-entrepreneurship. If you like it, you can choose stay and learn among the top growth-minded dentists and dental entrepreneurs in the industry; if you don’t, we give you the option of leaving. In order to get the maximum experience, DEO Members are expected to be committed and engaged with their peers. Each month you, will be expected to dedicate a total of 2-4 hours to engaging with your peers and the Membership content. This includes various online group calls, peer “Mastermind” calls, and select exercises and homework. Also, you will be encouraged to attend a minimum of 2 events during your first year, with the option to attend additional events at your discretion. How long is my initial agreement? We ask for an initial 12-month written commitment from DEO Members. After 12 months, you have the option to continue the program and move on to the next steps or not. We believe real transformation, real peer community, and real results begin with a committed group of like-mind individuals, and those real results do not happen overnight True personal and professional growth takes time, and there are no quick-fix shortcuts. What if I can’t attend a live event? First-year event attendance is highly encouraged, but if it’s necessary to miss an event, you will be given the opportunity to catch up by watching videos and committing to additional exercises. Additionally, you will have the chance to attend the next DEO class event. What Happens After 12 Months? After 12 months, you will have be given the option to graduate into the larger DEO group. You’ll join a community of dentist-entrepreneurs and professionals, where you’ll continue your journey by collaborating, developing yourself, building your team, and growing your business. Click below to schedule a call with The DEO Team. We’ll answer any additional questions and get you pointed in the right direction based on your individual circumstances.